This article is about the film. For the zoo and safari park in Denmark, see Givskud Zoo. Zootopia (known as Zootropolis in some regions) is a 2016 American 3D computer-animated comedy film produced by Walt Disney Animation Studios and released by Walt Disney Pictures. It is the 55th Disney animated feature film. It was directed by Byron Howard and Rich Moore, co-directed by Jared Bush, and stars the voices of Ginnifer Goodwin, Jason Bateman, Idris Elba, Jenny Slate, Nate Torrence, Bonnie Hunt, Don Lake, Tommy Chong, J. K. Simmons, Octavia Spencer, Alan Tudyk, and Shakira. It details the unlikely partnership between a rabbit police officer and a red fox con artist, as they uncover a conspiracy involving the disappearance of savage predator inhabitants of a mammalian metropolis. Zootopia premiered at the Brussels Animation Film Festival in Belgium on February 13, 2016, and went into general theatrical release in conventional 2D, Disney Digital 3-D, RealD 3D, and IMAX 3D formats in the United States on March 4. Critics praised its screenplay, animation, voice acting, and subject matter. It opened to record-breaking box offices in several countries, and earned a worldwide gross of over $1 billion, making it the fourth-highest-grossing film of 2016, the 34th-highest-grossing film of all time, the fourth animated film to pass $1 billion in global box-office earnings, and Walt Disney Animation Studios' highest-grossing film since 2013's Frozen. The film earned numerous accolades; it was named one of the top ten best films of 2016 by the American Film Institute, and received an Academy Award, Golden Globe, Critics' Choice Movie Award, and Annie Award for Best Animated Feature Film, as well as receiving a nomination for the BAFTA Award for Best Animated Film. In a world populated by anthropomorphic mammals, rabbit Judy Hopps from rural Bunnyburrow fulfills her childhood dream of becoming a police officer in urban Zootopia. Despite Judy being the academy valedictorian, Chief Bogo doubts her potential and delegates her to parking duty. On her first day, she is hustled by a con artist fox duo, Nick Wilde and Finnick. Judy abandons parking duty to arrest Duke Weaselton, a weasel who stole a bag of crocus bulbs known as Midnicampum holicithias. As she is reprimanded by Bogo, an otter named Mrs. Otterton enters Bogo's office pleading for someone to find her husband Emmitt, one of fourteen predators who have gone missing. Bogo is forced to let a volunteering Judy take the case when Assistant Mayor Dawn Bellwether praises the assignment. He gives Judy 48 hours to find Emmitt on the condition that she must resign if she fails. Deducing that Nick was the last to see Emmitt, Judy blackmails him into assisting her by covertly recording his confession to tax evasion. They track Otterton to a limousine owned by crime boss Mr. Big, who reveals Otterton went "savage"—reverted to a feral state—and attacked his chauffeur Manchas. At his home, Manchas mentions Otterton yelled about "night howlers" before the attack. Manchas himself then turns savage and chases the pair. Judy saves Nick by trapping Manchas and calls the ZPD for help, but Manchas flees before they arrive. Bogo demands Judy's resignation, but Nick defends Judy and begins to bond with her over shared experiences of prejudice. Judy and Nick then travel to the City Hall to access to the city's traffic cameras. They discover Manchas was captured by wolves, who Judy surmises are the "night howlers". They locate the missing predators—whom have all turned savage—imprisoned at Cliffside Asylum, where Mayor Leodore Lionheart is secretly while attempting to determine the cause of their behavior. Lionheart and the asylum staff are arrested for false imprisonment, and Bellwether becomes the new mayor. Judy, praised for solving the case, asks Nick to join the ZPD as her partner. At her following press conference however, Judy suggests that the cause of the savage behavior is predator biology, which causes an angered Nick to refuse Judy's offer. Guilt-ridden at inciting hateful speech and discrimination against predators throughout Zootopia, Judy resigns from the ZPD and returns to Bunnyburrow. Back home, Judy learns that the night howlers are actually the crocus bulbs Weaselton stole, and they contain a neurotoxin that has severe psychotropic effects on mammals which cause them to turn savage. After returning to Zootopia and reconciling with Nick, the pair confront Weaselton, whom is pressured by Mr. Big and reveals that the bulbs he stole were meant for a ram named Doug. They find Doug in a laboratory hidden in the city subway developing a drug made from night howlers, which he has been shooting at predators with a dart gun. Judy and Nick obtain the serum as evidence, but before they can reach the ZPD, Bellwether confronts them in the Natural History Museum, revealing herself as the mastermind behind a prey-supremacist conspiracy to frame predators as dangerous and savage. Bellwether retrieves the evidence after Nick refuses to abandon an injured Judy. She shoots Nick with a serum pellet to make him attack Judy, which are instead revealed to have been replaced with blueberries by Nick. Judy then baits Bellwether into openly declaring her role in the attacks and records the confession. Bellwether is arrested, while Lionheart publicly denies knowledge of her plot and defends his imprisonment of the savage predators. The savage animals are cured and Judy rejoins the ZPD. Nick graduates from the Zootopia Police Academy as the city's first fox police officer and becomes Judy's partner. Ginnifer Goodwin as Officer Judy Hopps, an optimistic rabbit from Bunnyburrow who is a newly appointed member of the Zootopia Police Department assigned to the 1st Precinct. Della Saba voices a younger Judy Hopps. Jason Bateman as Nick Wilde, a sly red fox who is a small-time con artist. Idris Elba as Chief Bogo, an African buffalo who is the police chief of the Zootopia Police Department's 1st Precinct. Jenny Slate as Dawn Bellwether, a diminutive sheep who is the assistant mayor of Zootopia. Nate Torrence as Officer Benjamin Clawhauser, an obese cheetah who works as a dispatcher and desk sergeant for the Zootopia Police Department's 1st Precinct. Bonnie Hunt as Bonnie Hopps, a European rabbit from Bunnyburrow who is the mother of Judy Hopps. Don Lake as Stu Hopps, a European rabbit from Bunnyburrow who is the father of Judy Hopps and a known carrot farmer. Tommy Chong as Yax, a laid-back domestic yak who is the owner of the naturist club Mystic Springs Oasis in Sahara Square. J. K. Simmons as Leodore Lionheart, a lion who is the noble, but pompous Mayor of Zootopia. Octavia Spencer as Mrs. Otterton, a concerned North American river otter whose husband Emmitt Otterton has gone missing. Alan Tudyk as Duke Weaselton, a small-time least weasel crook who is also known for selling bootleg DVDs. The name is a reference to the Duke of Weselton from Frozen, whom Tudyk also voices. Shakira as Gazelle, a Thomson's gazelle who is a famous pop star. Shakira also voices Gazelle in the Spain and Latin America Spanish dubs. Raymond S. Persi as Flash, the "fastest" three-toed sloth in the DMV (short for Department of Mammal Vehicles). Persi also voices Officer Higgins, a hippopotamus who is an elite member of the Zootopia Police Department's 1st Precinct. Maurice LaMarche as Mr. Big, an Arctic shrew who is the most fearsome crime boss in Tundratown and is served by a group of polar bears. Phil Johnston as Gideon Grey, a red fox from Bunnyburrow who used to bully the young rabbits and sheep when he was young. As an adult, he has made amends with those he picked on and became a much-respected baker. Johnston also voices an angry offscreen character who states that his taxes pay Judy's salary upon being given a parking ticket by her. Fuschia! as Major Friedkin, a polar bear who works at the Zootopia Police Academy as drill instructor. John DiMaggio as Jerry Jumbeaux Jr., an ill-tempered African elephant who owns an ice cream parlor called Jumbeaux's Café which is frequented by elephants and other larger mammals. DiMaggio also voices Woolter and Jesse (a pun on the show Breaking Bad's main protagonists), two tough rams who are Doug's assistants; a moose that gets a parking ticket from Judy; and a pig reporter. Katie Lowes as Dr. Madge Honey Badger, a honey badger who helps Mayor Lionheart look for the cause of the animals going savage. Gita Reddy as Nangi, an Indian elephant who works as a yoga instructor at Mystic Springs Oasis. Jesse Corti as Manchas, a black jaguar from Zootopia's Rainforest District who is a chauffeur for Zootopia's biggest limo company and is the personal chauffeur to Mr. Big. Tom Lister Jr. as Finnick, a fennec fox who is Nick's partner in crime. Josh Dallas as an unnamed frantic domestic pig who is the owner of the "Flora and Fauna" flower shop that is robbed by Duke Weaselton and frantically asks Judy for help. He later appears as a protestor at Gazelle's peace rally arguing with a female leopard. Leah Latham as Fru Fru, the daughter of Mr. Big who disapproves of her father doing his criminal business during her wedding. She befriends Judy after Judy saves her from a runaway doughnut shop sign in Little Rodentia and later names her unborn child after her. Rich Moore as Doug, an emotionless ram chemist and sniper with puffy wool who works for Assistant Mayor Bellwether. Moore also voices Larry, a gray wolf that is a security guard at Cliffside Asylum. Peter Mansbridge as Peter Moosebridge, a moose co-anchor of the ZNN News. The moose is used in the standard version of the film, released in the United States, Italy, France, Canada, Russia, and Mexico. In the UK version, the moose is named as Moosos Alexander, voiced by radio journalist Vassos Alexander (though the UK home release used his US name and voice). In other countries, the anchor is a different animal voiced by a different person. David Campbell voices a koala newscaster named David Koalabell in the Australian and New Zealand versions. The Brazilian version uses a jaguar named Onçardo Boi Chá who is voiced by Ricardo Boechat. The Japanese version uses a tanuki named Michael Tanuyama who is voiced by Kazumasa Kōra. The Chinese version uses an unnamed giant panda. Byron Howard as Bucky Oryx-Antlerson, a greater kudu who is the neighbor of Judy Hopps. Howard also voices Travis, Gideon Grey's black-footed ferret friend. Jared Bush as Pronk Oryx-Antlerson, a gemsbok who is the neighbor of Judy Hopps. Mark "Rhino" Smith as Officer McHorn, a black rhinoceros police officer who is part of the Zootopia Police Department's 1st Precinct. Josie Trinidad as Mrs. Dharma Armadillo, a nine-banded armadillo who is the landlady of the Grand Pangolin Apartments that Judy Hopps moves into. John Lavelle as the unnamed construction mouse foreman of Little Rodentia's construction crew who receives the Pawpsicle sticks from Nick and Finnick. Kristen Bell as Priscilla, a three-toed sloth who is Flash's co-worker at the DMV. Development of the film that would come to be called Zootopia began when Byron Howard pitched six story ideas to Disney Animation chief creative officer and executive producer John Lasseter, of which three involved animal characters: an all-animal adaptation of The Three Musketeers, a 1960s-themed story about a "mad doctor cat...who turned children into animals", and a "bounty-hunter pug in space". The common thread running through these ideas was that Howard wanted to do a film similar to Disney's Robin Hood, which also featured animals in anthropomorphic roles. According to Howard, Zootopia emerged from his desire to create something different from other animal anthropomorphic films, where animals either live in the natural world or in the human world. His concept, in which animals live in a modern world designed by animals for animals, was well received by Lasseter, who responded by embracing and lifting Howard "in the air like a baby Simba". Lasseter suggested that Howard should try combining the 1960s theme with the animal characters, especially the space pug. This led Howard to develop and pitch Savage Seas, an international spy film centered on an arctic hare named "Jack Savage" who was somewhat like James Bond. It was around this time that screenwriter Jared Bush was hired to work on the film; he was excited to work on a spy film because his own father and grandfather had worked for the Central Intelligence Agency. Howard and Bush continued to develop the film with the assistance of the Disney Story Trust, the studio's top creative personnel who meet regularly to review and discuss all projects in development. The most delightful part of the spy film turned out to be its first act, set in a city created by and for animals. To focus on the all-animal city, Howard eventually dropped the 1960s setting, along with the espionage and international aspects, which caused the film to evolve into a contemporary police procedural in which Nick Wilde was the lead role and Judy Hopps was essentially his sidekick. For a while, "the filmmakers were very committed" to that version of the story, but then in November 2014, the filmmakers realized the film's plot would be more engaging if they reversed the roles to instead focus on Hopps as opposed to Wilde. The change in perspective caused several characters to be dropped, including two characters known as "The Gerbil Jerks" who were described as "trust-fund gerbils that had nothing better to do than harass Nick." In May 2013, The Hollywood Reporter initially reported that Howard was directing the film and that Jason Bateman had been cast, but little else about the film was known at the time. Zootopia was first officially announced in August 2013 at the D23 Expo, with a March 2016 release date. Research for the film took place in Disney's Animal Kingdom, as well as in Kenya and the San Diego Zoo Safari Park, where animators spent eight months studying various animals' walk cycles as well as fur color. Eight hundred thousand forms of mammals were created for and featured in the film. To make the characters' fur even more realistic, they also went to the Natural History Museum of Los Angeles County to closely observe the appearance of fur with a microscope under a variety of lighting. 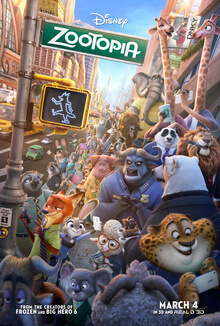 The filmmakers drew inspiration for Zootopia's urban design from major cities including New York City, San Francisco, Las Vegas, Paris, Shanghai, Hong Kong, and Brasília. To develop a city that could actually be inhabited by talking mammals ranging in size from two inches (5.1 cm) to 27 feet (8.2 m) and from drastically different climates, the filmmakers consulted Americans with Disabilities Act specialists and HVAC system designers. For assistance with designing motor vehicles appropriate for so many different types and sizes of mammals, the filmmakers consulted with J Mays, former chief creative officer of the Ford Motor Company. During the development process, Walt Disney Studios chairman Alan F. Horn suggested that Nick should expressly state his disappointment ("Just when I thought someone actually believed in me...") after discovering that Judy still fears him as a predator. In March 2015, it was revealed that Rich Moore (Wreck-It Ralph) had been added as a director of the film, in addition to Jared Bush (Penn Zero: Part-Time Hero) as co-director. Disney's most recent work on animating fur was for the titular character of the 2008 film Bolt, but the software they had used at the time was not ready for creating the realistic fur of the animals of Zootopia. Therefore, the studio's IT engineers developed the fur-controlling software "iGroom", which gave character designers precise control over the brushing, shaping and shading of fur and made it possible to create a variety of eccentric character styles for each animal. The software was also able to control an unseen "imaginary" under-layer that gave fur a degree of plushness not seen before. This feature was used to create characters like Officer Clawhauser, who has a big head that is entirely made of spotted fur. Characters with noteworthy numbers of strands of hair or fur included both of the two lead characters, Judy Hopps and Nick Wilde, who each had around 2.5 million hairs; a giraffe with nine million strands of fur; a gerbil with 480,000 strands; and a rodent with more strands of hair than the 400,000 that were on Elsa's head in Frozen. Zootopia was the second time Disney used the Hyperion renderer, which they had first used on Big Hero 6. A new fur paradigm was added to the renderer to facilitate the creation of realistic images of the animals' dense fur. Nitro, a real-time display application developed since the making of Wreck-It Ralph, was used to make the fur more consistent, intact and subtle much more quickly, as opposed to the previous practice of having to predict how the fur would work while making and looking at silhouettes or poses for the character. The tree-and-plant generator Bonsai, first used in Frozen, was used to make numerous variations of trees with very detailed foliage. Zootopia was produced in makeshift quarters in a giant warehouse in North Hollywood (together with Moana) while Disney Animation's headquarters in Burbank was being renovated. On May 6, 2015, Bateman and Ginnifer Goodwin were announced as having been cast, respectively in the roles of Nick Wilde and Judy Hopps. The filmmakers chose Bateman because they wanted an actor who could bring "a funny yet heartfelt side" with "a wily, dry-witted sort of voice". Bateman described his character as "a crafty, sarcastic schemer", remarking on the role's similarity to many other roles he had done since he was 12. He explained that he had said to the directors: "'What kind of voice do you guys want me to do?' And they just looked at me like I was an idiot and said, 'Just do what you do. Just talk.'" Commenting on the casting of Goodwin, Moore said that she brought "very centered sweetness, tremendous heart and a great sense of humor"; he described Judy as "a little Pollyanna mixed with Furiosa". Goodwin stated about her character: "People mistake kindness for naivete or stupidity, and she is a good girl through and through. But she's not a dumb bunny." The film's score is composed by Michael Giacchino. It marks his first feature-length project for Walt Disney Animation Studios, as he previously scored the Goofy short How to Hook Up Your Home Theater, the two Prep & Landing specials and short film, and the short film The Ballad of Nessie, as well as multiple Pixar films. In addition to her voice role of Gazelle, pop star Shakira also contributed an original song to the film titled "Try Everything", which was written by Sia and Stargate. The film's score was recorded by an 80-piece orchestra in November 2015, with Tim Simonec conducting. The soundtrack was released on March 4, 2016 by Walt Disney Records. All music composed by Michael Giacchino, except where noted. Zootopia was released in Disney Digital 3-D, RealD 3D, and IMAX 3D, making it the first Disney animated film shown in domestic IMAX theatres since Treasure Planet (2002). The film was retitled for theatrical release across several international territories. In the United Kingdom and other European, Middle Eastern, and North African countries, the film was renamed Zootropolis, a reference to the concept of a "metropolis" rather than to that of a "utopia". This was due to Disney being unable to trademark the name "Zootopia" in these territories for various legal reasons, including Danish Givskud Zoo registering the name Zootopia in 2014. In China, the state's SAPPRFT granted the film a rare two-week extension to play in theaters in addition to its limited 30-day run, which was to have ended on April 3. In Germany, the film was titled Zoomania due to a children's book by German author Kay Fischer titled "Zootopolis" released in 2010. The first teaser trailer was released online at Walt Disney Animation Studios' YouTube page on June 11, 2015. A second teaser trailer was released online again at Walt Disney Animation Studios' YouTube page on November 23, 2015, featuring a sequence of the film where the main characters encounter a Department of Mammal Vehicles (based on the DMV) run entirely by sloths. The official theatrical trailer for the film was released online at Walt Disney Animation Studios' YouTube page on New Year's Eve 2015. Figures of Judy Hopps and Nick Wilde were released for Disney Infinity 3.0 on March 1, 2016. Zootopia was released by Walt Disney Studios Home Entertainment on Blu-ray, Blu-ray 3D, DVD, and Digital HD platforms on June 7, 2016. It includes some bonus material such as "Scoretopia", an alternate opening, and the music video to Shakira's "Try Everything". The film debuted at the top of the home media sales chart for the week ending on June 12, 2016. In India, the satellite rights were sold to Star Movies. Zootopia grossed $341.3 million in the U.S. and Canada and $682.5 million in other countries for a worldwide total of $1.024 billion, against a budget of $150 million. On March 18, 2016, the film reached the $500 million mark, becoming the third consecutive Walt Disney Animation Studios film to reach the milestone after Frozen (2013) and Big Hero 6 (2014). On April 5, it became the first film of 2016 to gross over $800 million in ticket sales, and on April 24, became the first ever film of 2016 to cross $900 million. On June 5, the film crossed the $1 billion mark, becoming the second film of 2016 to do so (after the studio's own Captain America: Civil War), the fourth animated film (after Toy Story 3, Frozen, and Minions), the eleventh Disney film (third Disney animated film), and the twenty-sixth film overall to break the milestone. Worldwide, it was the fourth-highest-grossing film of 2016 (behind Civil War, Rogue One, and Finding Dory), the second-highest-grossing animated film of 2016, the second-highest-grossing Walt Disney Animation Studios film (second-highest overall) of all time in its original release (after Frozen), the second-highest-grossing original film (behind Avatar), the fifth-highest-grossing animated film of all time, and the 30th-highest-grossing film of all time. Deadline Hollywood calculated the net profit of the film to be $294.9 million, when factoring together all expenses and revenues for the film, making it the fifth-most profitable release of 2016. In the United States and Canada, pre-release tracking suggested the film would open to $60–70 million from 3,827 theaters in its opening weekend. It played in 3,100 3D theaters, 365 IMAX theaters, and 325 premium large format screens. It earned $1.7 million from Thursday previews, a record for a non-Pixar Disney animated film, for an animated film opening outside of summer, and seventh-biggest all time for an animated film. Buoyed by good word of mouth, it earned $19.5 million on its opening day, also a record for a non-Pixar Disney animated film (breaking Frozen's record), and the second-biggest for a March animated film (behind Ice Age: The Meltdown). In its opening weekend, it scored a better than expected $75.1 million, which was the biggest non-Pixar Disney animated opening (breaking Big Hero 6's record), the biggest opening weekend among Walt Disney Animation Studios films (breaking Frozen's record), the biggest March animated opening (breaking The Lorax's record), the seventh-biggest March opening, and the tenth-biggest animated opening of all time. Furthermore, its opening weekend is also the fourth-biggest for an original film, behind The Secret Life of Pets, Inside Out, and Avatar. It also performed exceptionally well in IMAX, where the film brought in $5.2 million from 366 screens, the second-best animated IMAX opening behind only Toy Story 3 ($8.4 million). In its second weekend, it fell gradually by 31% to $51.3 million and recorded one of the best holds for an animated film, more or less on par with Wreck-It Ralph's second weekend drop of 32%, but a bigger drop than The Lego Movie's 27%. It continued to top the box office for the third weekend, earning $37.2 million, falling by 28% from its previous weekend while passing the $200 million mark. This made it the second-biggest third weekend for a film that did not open at over $100 million, behind Avatar ($68 million) and ahead of Skyfall ($35 million). The film was overtaken by the superhero film Batman v Superman: Dawn of Justice in its fourth weekend, despite only a marginal decline. It spent a total of 13 consecutive weeks in the top ten, more than any other film except for Avatar (14 weeks) and Frozen (16 weeks) over the last decade. It ended its theatrical run on August 4, 2016, after playing in theaters for a total of 154 days. It became the second-highest-grossing Walt Disney Animation Studios film (behind Frozen), the seventh-highest-grossing film of 2016, and the tenth-highest-grossing animated film of all time. Zootopia received a scattered release as Walt Disney Studios Motion Pictures took advantage of school holidays in various markets. The film opened in a limited number of international markets in the weekend ending February 14, earning $4.5 million in three markets. It expanded to 22 markets in its second weekend, into 36% of its total international markets, and added $31.2 million. It added another $33 million in its third weekend with no new markets. In its fourth weekend, it expanded to 45 countries and grossed $64.7 million, coming in second place at the international box office, behind the Chinese film Ip Man 3. $3.3 million came from IMAX showings. It finally topped the box office in its fifth weekend after a strong second-weekend gross in China. It added $89.3 million from 45 countries, an increase of 25% from its previous weekend. It remained in first place for the second time in its sixth weekend, before Batman v Superman: Dawn of Justice took the top spot. It passed the $500 million mark in its eighth weekend. In its opening weekend—which varied between markets—the film grossed $3.1 million in Spain and an additional $1.7 million in Belgium and Denmark. In Belgium, it had the biggest ever animated opening for a Disney or Pixar film. It broke opening records for a non-Pixar Disney animated film in China ($23.6 million), France ($8.1 million), Russia ($7.8 million), Germany ($6.6 million), Hong Kong ($1.5 million), Poland ($1.2 million), and India. It opened in the United Kingdom and Ireland with $7.5 million, Mexico with $4.6 million, Australia with $3.2 million, Brazil with $2.6 million, and in Italy, on a non-holiday weekend with $3.1 million. The film had number-one openings in Austria, Switzerland, Portugal, and South Africa. In the UK and Ireland, with significant competition from Batman v Superman: Dawn of Justice and the animated family film Kung Fu Panda 3, the film had a £5.31 million ($7.6 million) opening weekend from 579 theaters, including £1.74 million ($2.5 million) worth of previews, debuting in second place behind Dawn of Justice and falling just short of Walt Disney Animation Studios' best opening in the UK. It fell just 24% in its second weekend. Zootopia's largest markets overseas are China ($235.6 million), followed by Japan ($70.1 million), Russia and the CIS ($39.2 million), Germany ($34.2 million), the UK ($34.2 million), France ($31.9 million), and South Korea ($31.6 million). In China, it is the highest-grossing Disney film in local currency (¥1.530 billion), surpassing Avengers: Age of Ultron (¥1.464 billion), as well as the seventh-highest-grossing film of all time. In Russia, it is the second-highest-grossing film of all time in local currency (₽2.3 billion), behind only Avatar (₽3.6 billion). It topped the Russian and German box office for three weekends, and the Chinese and Korean box office for two weekends. In China, where it was locally known as Crazy Animal City (疯狂动物城), the film exceeded expectations and was considered Hollywood's biggest breakout success in China since 2015's Jurassic World made $229 million. It had an opening day of $3.4 million on its way to $23.6 million for its three-day opening weekend, debuting in second place and scoring the biggest non-sequel animated opening, as well as the second-biggest three-day opening and IMAX opening for an animated film, behind Kung Fu Panda 3. In its ninth day of release (a Saturday), it recorded the biggest single-day gross ever for an animated film, with $25 million (compared to $10.6 million on its first Saturday), and passed the lifetime total of Big Hero 6 to become the highest-grossing Disney animated film in China. In its second weekend, it grossed $60 million, an enormous increase of 139% from its previous weekend, and crossed the $100 million mark to become the third animated film in China to do so, after Kung Fu Panda 3 and Monkey King: Hero Is Back. This also marked the single best weekend for an animated film. In mid-March, the combined total of Kung Fu Panda 3 and Zootopia alone broke 2014's record of $286 million in box office grosses for American animated features in China. In its third weekend, it grossed $40 million for a total of $175 million, making it the highest-grossing animated film of all time in China. On March 27, its seventeenth day of release, it passed the $200 million mark, becoming the first animated film, the second Disney film, and the sixth Hollywood film overall to pass that milestone. It became the highest-grossing animated film of all time and the second-highest-grossing film of 2016, behind only The Mermaid. It opened in Japan on April 23 and earned $4 million in its opening weekend, debuting at second place in the box office, behind Detective Conan: The Darkest Nightmare, and had the third-biggest Walt Disney Animation Studios debut in that market, behind Frozen and Big Hero 6. Deadline.com pointed out that the average opening number might have been due to the 2016 Kumamoto earthquakes, which could have affected moviegoers. In a rare achievement, it topped the box office in its third weekend after two weeks at No. 2. In the following two weekends, it continued to increase its ticket sales, and topped the box office there for four consecutive weekends. After four straight wins, it was finally overtaken by the R-rated superhero film Deadpool. It was the No. 1 western/Hollywood film for eight consecutive weekends. The Hollywood Reporter cited that strong word of mouth, audiences watching both the English and Japanese versions, and 3D and 4DX screenings, as well as a popular Japanese version of the "Try Everything" song by Dream Ami, all helped boost Zootopia's performance. Its strong run in the market aided the film to propel past the $1 billion mark worldwide. It remained in top three for 11 consecutive weekends and has grossed a total of $70.1 million there. On the review aggregator Rotten Tomatoes, the film has an approval rating of 97% based on 274 reviews, with a weighted average rating of 8.06/10. The website's critical consensus reads, "The brilliantly well-rounded Zootopia offers a thoughtful, inclusive message that's as rich and timely as its sumptuously state-of-the-art animation – all while remaining fast and funny enough to keep younger viewers entertained." It was the site's second-highest-rated film of 2016 behind Moonlight. On Metacritic, the film has a score of 78 out of 100, based on 43 critics, indicating "generally favorable reviews". Audiences polled by CinemaScore gave the film an average grade of "A" on an A+ to F scale. Neil Genzlinger of The New York Times considered the movie "funny, smart, [and] thought-provoking". Peter Travers of Rolling Stone wrote that Zootopia "may be the most subversive movie of" 2016, giving the film three-and-a-half stars out of four and praising its timely message about the harm of prejudice in the face of the prevailing xenophobic political rhetoric at the time of the film's release, and the film's humor. Peter Debruge at Variety opined that Zootopia "plays directly to the studio's strength". IGN reviewer Eric Goldman gave the film a 9.0 out of 10 'Amazing' score, saying "Zootopia is a wonderful example of how Disney, at its best, can mix its past and present together in a very cool, compelling way. It takes the classic animation trope of animals walking, talking and acting like humans, but gives it a modern spin both in terms of its humor and animation style ... and also in its themes, which are meaningful and fascinatingly topical." Writing in British Sunday newspaper The Observer, reviewer Mark Kermode found the film to be a "very funny, and very likable holiday treat". He added, "The ensuing drama is nominally a tale of predators succumbing to their animal instincts while frightened prey fear their neighbours. In fact, it's a delightfully well-orchestrated parable about trust and tolerance versus panic and prejudice. An encouragingly upbeat celebration of love and diversity in times of hate and uncertainty. If that all sounds overly on-message, then fear not—the jokes are funny, the characters engaging, and the animation packed with delicious visual detail", before concluding, "[…] this is proper family fun with genuine cross-generational appeal. Hooray!" In the UK daily newspaper The Daily Telegraph, Robbie Collin noted, "The lion doesn't just lie down with the lamb, they run for City Hall on a joint ticket. It's the diversity dream come true. Or is it? […] Think Busytown by way of Chinatown. It's almost certain to be the most existentially probing talking animal cartoon of the year." Collin added, "Like Nick Nolte and Eddie Murphy in 48 Hrs., albeit considerably cuter, Judy and Nick make a hilariously strained but effective double act – not least thanks to Goodwin and Bateman's tremendous vocal work, which trips along with the effortless swing and snap of great bebop." Matt Zoller Seitz of RogerEbert.com, despite generally liking the film (three out of four stars), had trouble with the film's central metaphor that conflicted with its message, stating that "[Zootopia] is constantly asking its characters to look past species stereotypes, and not use species-ist language or repeat hurtful assumptions.... This all seems clever and noble until you realize that all the stereotypes about various animals are to some extent true, in particular the most basic one: carnivores eat herbivores because it's in their nature." He ended his review pointing out that "if [Zootopia] were a bit vaguer, or perhaps dumber and less pleased with itself, it might have been a classic, albeit of a very different, less reputable sort. As-is, it's a goodhearted, handsomely executed film that doesn't add up in the way it wants to." Also in The Daily Telegraph, Rosa Prince singled out the film's lead character, Judy Hopps, as a welcome change for Disney animated feature film heroines, such as the Disney Princess franchise. She found that unlike those characters' focus on romance or family loyalty, Hopps' focus is on her dream career as a police officer and serving her city. Some were critical of the message about universal prejudices of all sorts interpreted as an allegory of American racism. Nico Lang of Consequence of Sound felt that Disney delivered a kids' version of Crash, while others criticized the use of prey and predator species in the "allegory". The film was chosen by the American Film Institute as one of the top ten films of 2016, and won the Academy Award, Golden Globe, Critics' Choice Movie Award and Annie Award for Best Animated Feature Film, as well as receiving a nomination for the BAFTA Award for Best Animated Film. On March 21, 2017, a copyright infringement lawsuit was filed against Disney by Esplanade Productions, a company owned by Gary L. Goldman, the co-screenwriter of Total Recall. The lawsuit claims that Goldman (in 2000 and 2009) pitched a concept to Disney for a live-action film titled Looney, which was about a socially awkward animator who creates a self-inspired TV cartoon called Zootopia. Disney twice rejected the pitch, but Goldman accused the company of copying the name, themes, settings, and character tropes. Filed with the lawsuit was a graphic of early concept artwork of characters that are claimed to appear similar to major characters from the film, including Nick Wilde, Judy Hopps, Flash, and Chief Bogo. A Disney spokesperson described the lawsuit as being "ridden with patently false allegations". After months of back-and-forth deliberation between the two parties, U.S. District Judge Michael W. Fitzgerald dismissed the infringement claims on November 8, 2017. As stated in the final review, "...Goldman's effort to make the plots of Looney and Zootopia seem similar were strained. All the purported similarities between the two works were themes, not plot points or sequences of events, that were too general to be protected by copyright law." In May 2018, it was announced that a Zootopia graphic novel is set to be published by Dark Horse Comics. The graphic novel, titled Disney Zootopia: Friends to the Rescue, was written by Jimmy Gownley, with art by Leandro Ricardo da Silva. It was released on September 25, 2018. On January 22, 2019, Disney Parks announced that a themed area based on Zootopia is in development at Shanghai Disneyland Park. In June 2016, Howard and Moore were in the talks about the possibility of a Zootopia sequel. In the same month, in an interview about challenges and ideas for Zootopia 2, Ginnifer Goodwin revealed that she wishes to reprise her role as Judy Hopps in a sequel. ^ "Ionia, MI - Official Website - "Zootopia"". Archived from the original on April 2, 2016. ^ "Zootropolis (PG)". British Board of Film Classification. February 17, 2016. Archived from the original on February 25, 2016. Retrieved February 17, 2016. ^ a b "'Zootopia' Tops the Box Office". The New York Times. Archived from the original on March 11, 2016. Retrieved March 13, 2016. ^ a b c "Zootopia (2016)". Box Office Mojo. IMDb. Archived from the original on May 28, 2017. Retrieved October 3, 2016. ^ Rosser, Michael (March 11, 2015). "Disney's 'Zootopia' renamed 'Zootropolis' for UK". m.screendaily.com. Retrieved May 29, 2017. ^ McNary, Dave (June 11, 2015). "Watch: Disney's 'Zootopia' Trailer Introduces Animal-Run World". Variety. Archived from the original on July 11, 2015. Retrieved July 25, 2015. ^ Hazelton, John (February 13, 2016). "'Zootopia': Review". ScreenDaily. Archived from the original on October 6, 2016. Retrieved October 4, 2016. ^ a b Yamato, Jen (November 10, 2014). "Disney Dates 2016 Animated Pics 'Zootopia' & 'Moana'". Deadline Hollywood. Archived from the original on November 11, 2014. Retrieved November 10, 2014. ^ a b Newswire, PR (February 3, 2016). "Disney's Zootopia To Be Released In IMAX® 3D Theatres Domestically And In Select International Markets Including China". Deadline Hollywood. Archived from the original on February 4, 2016. Retrieved February 3, 2016. ^ a b "Zootopia (2016)". Rotten Tomatoes. Fandango. Archived from the original on May 23, 2017. Retrieved February 22, 2019. ^ a b Travers, Peter (March 3, 2016). "Zootopia". Rolling Stone. Archived from the original on March 4, 2016. Retrieved March 4, 2016. ^ Matt Pressberg. "Anti-Racist 'Zootopia' Is Crushing It In Countries Where Diversity Often Doesn't Play". International Business Times. Archived from the original on May 13, 2016. ^ a b c Kit, Borys (May 6, 2015). "Ginnifer Goodwin Joins Jason Bateman in Disney Animation's 'Zootopia' (Exclusive)". The Hollywood Reporter. Archived from the original on May 9, 2015. Retrieved May 6, 2015. ^ a b Kit, Borys (May 3, 2013). "Disney, 'Tangled' Director Plot New Animated Feature With Jason Bateman (Exclusive)". The Hollywood Reporter. Archived from the original on May 7, 2013. Retrieved June 1, 2013. ^ a b c d e f g h i j k l m n Pedersen, Erik (October 26, 2015). "Disney's 'Zootopia' Cages Idris Elba, J.K. Simmons, Octavia Spencer & Others". Deadline Hollywood. Archived from the original on October 27, 2015. Retrieved October 27, 2015. ^ "Walt Disney Animation Has Found Its Own John Ratzenberger-Style Good Luck Charm". Cinemablend. Archived from the original on March 6, 2016. Retrieved March 13, 2016. ^ a b Kit, Borys (August 14, 2015). "Shakira Joins Voice Cast of Disney Animation's 'Zootopia'". The Hollywood Reporter. Archived from the original on August 17, 2015. Retrieved August 14, 2015. ^ Jared Bush (May 26, 2016). "@jordanolling Raymond Persi :)". Twitter. Retrieved June 1, 2016. ^ "Four New Photos And Trailer Are Here For Disney's ZOOTOPIA". December 31, 2015. Archived from the original on January 30, 2016. Retrieved January 22, 2016. ^ a b c d "Zootopia - Press Kit" (PDF). wdsmediafile.com. Walt Disney Studios. Retrieved March 13, 2016. ^ Jared Bush (May 23, 2016). "Amazing writer Phil Johnston... also the voice of Gideon. ;)". Twitter. Retrieved July 4, 2016. ^ "Zootopia Screenplay" (PDF). Walt Disney Studios Awards. p. 9. Archived (PDF) from the original on October 27, 2016. Retrieved January 24, 2017. ^ Sciretta, Peter (March 7, 2016). "Zootopia Writers Talk About Early Unused Concepts and More (Interview)". /Film. Archived from the original on February 2, 2017. Retrieved January 24, 2017. ^ Rich Moore (May 28, 2016). "Both of them (!!!) are voiced by my bud, the one and only @TheJohnDiMaggio! ☕️🐑🐑"Hey Doug, we got yer latte!"". Twitter. Retrieved June 1, 2016. ^ Rich Moore (June 14, 2016). "The Frantic Pig is at the flower shop & the Gazelle rally. The pig at the press conference is voiced by @TheJohnDiMaggio 🐷". Twitter. Retrieved June 14, 2016. ^ a b c d e f "Kristen Bell Voices a Sloth in Disney's 'Zootopia'". Stitchkingdom.com. February 1, 2016. Archived from the original on March 12, 2016. Retrieved March 13, 2016. ^ Rich Moore (January 1, 2016). "@joshdallas oh of course, how could I forget that it's FRANTIC PIG! I'm such a fake fan". Twitter. Retrieved July 4, 2016. ^ Bush, Jared. "@ByronPHoward @mytoiletpaper Larry! Done!". Retrieved February 24, 2018. ^ "Peter Mansbridge voices moose in Disney film 'Zootopia'". Toronto Sun. The Canadian Press. November 13, 2015. Retrieved November 14, 2015. ^ "Oscars and The Kebab Awards, The Chris Evans Breakfast Show - BBC Radio 2". BBC. Retrieved February 24, 2018. ^ a b Loughrey, Clarisse. "Zootropolis' new anchors change animal depending on what country you're in Archived March 8, 2016, at the Wayback Machine." The Independent. March 7, 2016. Retrieved March 7, 2016. ^ Moran, Jonathon (January 20, 2016). "Singer David Campbell adds voice to new Aussie Disney movie Zootopia". Daily Telegraph. Australia. Retrieved March 7, 2016. ^ Solari, Guilherme (December 5, 2015). "Ricardo Boechat vai dublar personagem brasileiro em nova animação da Disney" [Ricardo Boechat will dub Brazilian character in new Disney animation]. UOL (in Portuguese). Retrieved February 19, 2019. ^ "Onçardo Boi Chá". Zootopia Wiki. Wikia, Inc. Retrieved February 19, 2019. ^ Libbey, Dirk (March 7, 2016). "The One Character Zootopia Changed For International Audiences". Cinemablend. Archived from the original on March 8, 2016. Retrieved March 7, 2016. ^ Byron Howard. "@jordanolling That weasel is Travis (I did his voice). :)". Twitter. ^ "You Know The Rhino In "Zootropolis"? Turns Out It's Played By Rhino From "Gladiators"". Buzzfeed.com. July 8, 2015. Archived from the original on September 15, 2016. Retrieved February 4, 2017. ^ Rich Moore (May 10, 2016). "It is Josie, and the land lady's name is Mrs. Armadillo (pronounced arma-dee-yo)". Twitter. Retrieved May 10, 2016. ^ a b c d e f Julius, Jessica (2016). The Art of Zootopia. San Francisco: Chronicle Books. p. 9. ISBN 9781452154053. Archived from the original on February 16, 2017. Retrieved February 6, 2017. ^ a b Graser, Marc (August 9, 2013). "D23 Expo: Disney Reveals Animated 'Zootopia' for 2016". Variety. Archived from the original on December 13, 2013. Retrieved March 1, 2014. ^ Bahr, Lindsey (August 9, 2013). "Disney Animation preview: 'Frozen,' 'Big Hero 6,' at Disney's D23, Plus 'Zootopia' announced". Entertainment Weekly. Archived from the original on August 10, 2013. Retrieved August 9, 2013. ^ a b c d Deitchman, Beth (Spring 2016). "The Start of Zootopia: The filmmakers behind Walt Disney Animation Studios' latest film take us on a wonderful journey through Zootopia". Disney twenty-three. Burbank: Walt Disney Company. 8 (1): 26–28. ISSN 2162-5492. OCLC 698366817. ^ a b Lussier, Germain (January 20, 2016). "How Disney Fixed a Huge Mistake With Zootopia, Just One Year Before Release". io9. Gawker Media. Archived from the original on January 20, 2016. Retrieved January 20, 2016. ^ Alexander, Bryan. "Exclusive: Lost characters of 'Zootopia' found". USA Today. Archived from the original on June 6, 2016. Retrieved June 6, 2016. ^ King, Darryn (April 30, 2015). "Annecy Will Host Genndy Tartakovsky, Masaaki Yuasa, 'Zootopia' Directors, Richard Williams". Cartoon Brew. Archived from the original on June 28, 2015. Retrieved June 19, 2015. ^ Kilday, Gregg (December 4, 2013). "Pixar vs. Disney Animation: John Lasseter's Tricky Tug-of-War". The Hollywood Reporter. Archived from the original on December 5, 2013. Retrieved December 4, 2013. ^ Celestino, Mike (December 1, 2015). "With next year's "Zootopia", Walt Disney Animation Studios promises a different kind of talking animal movie". Inside the Magic. Archived from the original on December 8, 2015. Retrieved December 12, 2015. ^ a b c d e Lalwani, Mona (March 4, 2016). "Fur technology makes Zootopia's bunnies believable". Engadget. AOL. Archived from the original on April 14, 2016. Retrieved April 14, 2016. ^ Julius, Jessica (2016). The Art of Zootopia. San Francisco: Chronicle Books. p. 10. ISBN 9781452154053. Archived from the original on February 16, 2017. Retrieved February 7, 2017. ^ "Disney's 'Zootopia': Making A Movie That's Never Been Seen "Be-Fur"". Geeks of Doom. December 1, 2015. Retrieved March 15, 2016. ^ Keegan, Rebecca (March 4, 2016). "Did a Disney animated film really say that? If it's 'Zootopia,' prepare to be shocked". Los Angeles Times. tronc, Inc. Archived from the original on March 20, 2016. Retrieved March 20, 2016. ^ Julius, Jessica (2016). The Art of Zootopia. San Francisco: Chronicle Books. p. 6. ISBN 9781452154053. Archived from the original on March 14, 2017. Retrieved March 13, 2017. ^ Rainey, James (April 11, 2016). "Disney's Alan Horn Uses Low-Key Approach, Keen Creative Vision to Find Hits of the Future". Variety. Los Angeles: Variety Media. Archived from the original on December 20, 2016. Retrieved December 14, 2016. ^ "Walt Disney Animation Studios Reveals New Zootopia Concept Art". ComingSoon.net. CraveOnline. March 3, 2015. Archived from the original on March 6, 2015. Retrieved March 11, 2015. ^ Snetiker, Marc (November 24, 2016). "Moana directors Ron Clements, John Musker talk four decades Disney movies". Entertainment Weekly. New York: Time Inc. Archived from the original on January 18, 2017. Retrieved January 13, 2017. ^ a b Truitt, Brian (June 9, 2015). "Sneak peek: 'Zootopia' pairs unlikely pals". USA Today. Archived from the original on July 26, 2015. Retrieved July 25, 2015. ^ Truitt, Brian (November 16, 2015). "Michael Giacchino to score Disney's 'Zootopia'". USA Today. Archived from the original on November 17, 2015. Retrieved November 16, 2015. ^ "This News Don't Lie: Shakira is Coming to a Disney Movie Near You". Disney Playlist. August 14, 2015. Archived from the original on August 20, 2015. Retrieved August 15, 2015. ^ Evry, Max (November 16, 2015). "Disney's Zootopia Lands Composer Michael Giacchino" (Press release). ComingSoon.net. Archived from the original on November 18, 2015. ^ "Walt Disney Records Set To Release Zootopia Original Motion Picture Soundtrack" (Press release). Walt Disney Records. PR Newswire. March 4, 2016. Archived from the original on August 11, 2016. Retrieved August 18, 2017. ^ "Zootopia (Original Motion Picture Soundtrack)". iTunes. February 12, 2016. Retrieved August 18, 2017. ^ Rosser, Stephen (March 11, 2015). "Disney's 'Zootopia' renamed 'Zootropolis' for UK". ScreenDaily. Screen International. Archived from the original on March 12, 2015. Retrieved March 11, 2015. ^ White, James (March 11, 2015). "Disney's Zootopia Is Now Zootropolis". Empire. Archived from the original on April 2, 2015. Retrieved March 11, 2015. ^ a b Hoffman, Jordan (March 3, 2016). "Zootopia review – Disney's furry fable gets its claws out for the bigots". The Guardian. Archived from the original on March 28, 2016. Retrieved March 28, 2016. ^ "Zootopia' to be called 'Zootropolis' in the UK (possibly because of an actual zoo)'". Eye on Animation. Archived from the original on June 23, 2016. ^ Brzeski, Patrick (April 4, 2016). "China Box Office: 'Batman v Superman' Sinks 78 Percent in Second Weekend, Lands in Third Place". The Hollywood Reporter. Archived from the original on April 5, 2016. Retrieved April 4, 2016. ^ "Zoomania film review (in German)". moviejones.de News site. February 18, 2016. Archived from the original on June 8, 2017. Retrieved April 16, 2017. ^ Hilliard, Kyle (August 15, 2015). "Good Dinosaur, Zootopia, And Peter Pan On The Way". Game Informer. Archived from the original on December 28, 2015. ^ Arnold, Thomas K. (June 15, 2016). "'Zootopia,' '13 Hours' Take Two Top Spots on DVD, Blu-ray Disc Charts". Variety. Archived from the original on June 17, 2016. Retrieved June 18, 2016. ^ Anita Busch (March 18, 2016). "'Zootopia' To Cross $500M Globally Today". Deadline Hollywood. Archived from the original on March 20, 2016. Retrieved March 19, 2016. ^ Scott Mendelson (March 18, 2016). "Box Office: Disney's 'Zootopia' Tops $500M Worldwide". Forbes. Archived from the original on March 19, 2016. Retrieved March 19, 2016. ^ a b Nancy Tartaglione and Anita Busch (April 5, 2016). "'Zootopia' Hops To $800M+ Global; Top 2016 Grosser Still Has Play To Come". Deadline Hollywood. Archived from the original on April 6, 2016. Retrieved April 6, 2016. ^ a b c Nancy Tartaglione (April 24, 2016). "'Jungle Book' A $337M Offshore Beast As 'Huntsman' Musters $80M; 'Zootopia' Tops $900M Global – Intl B.O. Update". Deadline Hollywood. Archived from the original on April 24, 2016. Retrieved April 25, 2016. ^ Nancy Tartaglione (June 5, 2016). "'Zootopia' Hops Past $1B Global Box Office; Disney's 11th Time Over The Mark". Deadline Hollywood. Archived from the original on June 5, 2016. Retrieved June 5, 2016. ^ a b "2016 WORLDWIDE GROSSES". Box Office Mojo. IMDb. Archived from the original on January 31, 2017. Retrieved January 29, 2017. ^ a b Scott Mendelson (May 30, 2016). "Box Office: Disney's 'Zootopia' Is Now The Second-Biggest Original Movie Ever". Forbes. Archived from the original on May 30, 2016. Retrieved May 30, 2016. ^ Fleming Jr, Mike (March 29, 2017). "No. 5 'Zootopia' Box Office Profits – 2016 Most Valuable Movie Blockbuster Tournament". Deadline Hollywood. Archived from the original on May 18, 2017. Retrieved March 29, 2017. ^ a b D'Alessandro, Anthony (March 2, 2016). "Disney Unleashed: 'Zootopia' Toon Expected To Roar Past $60M – Weekend Preview". Deadline Hollywood. Archived from the original on March 3, 2016. Retrieved March 3, 2016. ^ McClintock, Pamela (March 3, 2016). "Box-Office Preview: Can 'London Has Fallen' Redeem Gerard Butler After 'Gods of Egypt'?". The Hollywood Reporter. Archived from the original on March 4, 2016. Retrieved March 4, 2016. ^ a b c D'Alessandro, Anthony (March 4, 2016). "'Zootopia' $70M Opening Is A Record For Original Disney Toon; 'London' Raises $22M; 'Whiskey' Trips – Friday Night B.O." Deadline Hollywood. Archived from the original on March 5, 2016. Retrieved March 5, 2016. ^ McClintock and Rebecca Ford, Pamela (March 4, 2016). "Box Office: 'Zootopia' Roars Friday for Huge $63M-$65M Weekend". The Hollywood Reporter. Retrieved March 4, 2016. ^ Brevet, Brad (March 3, 2016). "Disney's 'Zootopia' Targets March Animated Opening Record". Box Office Mojo. IMDb. Archived from the original on March 5, 2016. Retrieved March 5, 2016. ^ Mendelson, Scott (March 5, 2016). "Box Office: 'Zootopia' Could Score $75M Weekend After Mammoth $19.5M Friday". Forbes. Archived from the original on March 8, 2016. Retrieved March 6, 2016. ^ D'Alessandro, Anthony (March 7, 2016). "'Zootopia' $75.1M Opening Is A Record For Original Disney Toon; Pushes 2016 Past $2 Billion Mark – Monday B.O." Deadline Hollywood. Archived from the original on March 8, 2016. Retrieved March 8, 2016. ^ a b Brevet, Brad (March 6, 2016). "'Zootopia' Scores Disney Animation's Largest Opening Ever". Box Office Mojo. IMDb. Archived from the original on March 7, 2016. Retrieved March 7, 2016. ^ "Animation Movies at the Box Office - Box Office Mojo". Archived from the original on October 20, 2013. ^ Mendelson, Scott (March 6, 2016). "Weekend Box Office: 'Zootopia' Nabs Record-Breaking $73M US Debut For $232M Worldwide Total". Forbes. Archived from the original on March 9, 2016. Retrieved March 7, 2016. ^ Pamela McClintock (July 10, 2016). "Box Office: 'Secret Life of Pets' Bites Off Huge $103.2M Opening". The Hollywood Reporter. Archived from the original on October 11, 2016. Retrieved September 24, 2016. ^ Scott Mendelson (March 13, 2016). "Weekend Box Office: 'Zootopia' Snags $50M, 'Deadpool Tops $700M Global, 'Star Wars' Crosses $930M". Forbes. Archived from the original on March 14, 2016. Retrieved March 14, 2016. ^ Anthony D'Alessandro (March 20, 2016). "'Allegiant' Gang Mauled By 'Zootopia' Animals As 'Miracles' Happen – Sunday Update". Deadline Hollywood. Archived from the original on March 21, 2016. Retrieved March 20, 2016. ^ Scott Mendelson (March 20, 2016). "Weekend Box Office: 'Star Wars' Dips Under $1M, 'Deadpool' Tops 'Spider-Man 3, 'Zootopia' Near $600M". Forbes. Archived from the original on March 20, 2016. Retrieved March 20, 2016. ^ Anthony D'Alessandro (March 27, 2016). "'Batman V Superman' Opening Taking Pre-Summer, Easter & March & Warner Bros. Records — Early Sunday B.O. Update". Deadline Hollywood. Archived from the original on March 26, 2016. Retrieved March 27, 2016. ^ "Walt Disney Animation Studios". Box Office Mojo. Archived from the original on August 5, 2016. Retrieved August 6, 2016. ^ "2016 DOMESTIC GROSSES". Box Office Mojo. Archived from the original on December 27, 2016. Retrieved December 29, 2016. ^ "Animation". Box Office Mojo. Archived from the original on August 19, 2016. Retrieved August 20, 2016. ^ a b Busch, Anita (February 16, 2016). "'Deadpool,' 'Zoolander 2,' 'How To Be Single' All Jump Higher – Int'l Box Office Final". Deadline Hollywood. Archived from the original on February 16, 2016. Retrieved February 17, 2016. ^ a b c Tartaglione, Nancy (February 21, 2016). "'Deadpool' Scores $85.3M In 2nd Offshore Frame; Nears $500M Global – Intl Box Office". Deadline Hollywood. Archived from the original on February 22, 2016. Retrieved February 22, 2016. ^ Tartaglione, Nancy (February 28, 2016). "'Deadpool' At $609M Global; 'Gods Of Egypt' Bows To $24M, 'Zootopia' Lands $33M 3rd Frame – Int'l B.O. Final". Deadline Hollywood. Archived from the original on February 29, 2016. Retrieved March 1, 2016. ^ a b c d e Busch, Anita (March 6, 2016). "'Zootopia' Is Disney Animation Champ; 'Mermaid' Makes History; Best Picture 'Spotlight' Wins Big — Int'l Box Office Final". Deadline Hollywood. Archived from the original on March 6, 2016. Retrieved March 7, 2016. ^ a b Tartaglione, Nancy (March 13, 2016). "'Allegiant' Pledges $26.7M; 'Zootopia' Hops With $83M 5th Frame – Intl B.O. Update". Deadline Hollywood. Archived from the original on March 14, 2016. Retrieved March 14, 2016. ^ a b Tartaglione, Nancy (March 21, 2016). "'Zootopia' A Flash Away From $600M WW; China Welcomes 'The Revenant' With $31M Bow – Intl B.O. Final". Deadline Hollywood. Archived from the original on March 22, 2016. Retrieved March 21, 2016. ^ a b c d Nancy Tartaglione (March 28, 2016). "'Zootopia' Nears $700M Global; 'The Revenant' Crosses $500M Globally – International Box Office Final". Deadline Hollywood. Archived from the original on March 28, 2016. Retrieved March 29, 2016. ^ Nancy Tartaglione (April 4, 2016). "'Batman V Superman' At $422.5M Offshore; 'Zootopia' Crosses $500M; 'Deadpool' Tops $750M WW – Intl Box Office Final". Deadline Hollywood. Archived from the original on April 5, 2016. Retrieved April 5, 2016. ^ Kozlov, Vladimir (March 9, 2016). "Russia Box Office: 'Zootopia' Opens to Record $7.9M". The Hollywood Reporter. Archived from the original on March 10, 2016. Retrieved March 10, 2016. ^ Alex Ritman (March 19, 2016). "U.K. Box Office: 'Batman v. Superman' Smashes Superhero Record". The Hollywood Reporter. Archived from the original on March 29, 2016. Retrieved March 30, 2016. ^ Charles Gant (March 30, 2016). "Batman v Superman sets superpowered record at UK box office". The Guardian. Archived from the original on March 30, 2016. Retrieved March 30, 2016. ^ Charles Gant (April 5, 2016). "Eddie the Eagle soars at UK box office while Batman v Superman crashes". The Guardian. Archived from the original on April 8, 2016. Retrieved April 10, 2016. ^ "Zootopia (2016) - International Box Office Results". Box Office Mojo. IMDb. Archived from the original on December 22, 2016. Retrieved March 19, 2017. ^ Nancy Tartaglione (April 17, 2016). "'The Jungle Book' Packs $136.1M Offshore As WW Cume Nears $300M; 'Batman V Superman' At $516M Overseas – Intl B.O." Deadline Hollywood. Archived from the original on April 18, 2016. Retrieved April 18, 2016. ^ Nancy Tartaglione (May 8, 2016). "'Captain America: Civil War' Rages Offshore With $220M 2nd Frame, $497M Cume; 'Zootopia' Crosses $950M WW – Intl B.O." Deadline Hollywood. Archived from the original on May 10, 2016. Retrieved May 8, 2016. ^ "内地总票房_电影历史票房_中国票房". ChinaBoxOffice. Archived from the original on June 3, 2016. Retrieved June 4, 2016. ^ Scott Mendelson (April 10, 2016). "Weekend Box Office: 'Batman V Superman' Bested By 'The Boss' But Tops 'Man Of Steel'". Forbes. Archived from the original on April 10, 2016. Retrieved April 10, 2016. ^ "Рейтинги фильмов - самые большие кассовые сборы". Метрополитэн Медиа. Archived from the original on May 25, 2016. Retrieved June 4, 2016. ^ "Zootopia (2016) - International Box Office Results". Box Office Mojo. IMDb. Archived from the original on May 25, 2016. Retrieved June 3, 2016. ^ Scott Roxborough (March 21, 2016). "German Box Office: 'Zootopia' Rules for Third Weekend; 'Divergent: Allegiant' Disappoints". The Hollywood Reporter. Archived from the original on March 21, 2016. Retrieved March 22, 2016. ^ "Zootopia (2016) - International Box Office Results". Box Office Mojo. IMDb. Archived from the original on May 29, 2016. Retrieved June 3, 2016. ^ Sonia Kil (March 20, 2016). "Korea Box Office: 'Zootopia' Retains Weekend Top Spot". Variety. Archived from the original on March 22, 2016. Retrieved March 22, 2016. ^ Brzeski, Patrick (March 6, 2016). "China Box Office: 'Ip Man 3' Opens to $75M Amid Fraud Allegations, 'The Mermaid' First to Cross $500M". The Hollywood Reporter. Archived from the original on March 8, 2016. Retrieved March 7, 2016. ^ Jonathan Papish (March 14, 2016). "China Box Office: 'Zootopia' Is Setting Animation Records in China". China Film Insider. Archived from the original on March 15, 2016. Retrieved March 15, 2016. ^ McClintock, Pamela (March 12, 2016). "Box Office: 'Zootopia' Roars to Record $25M Saturday in China, Nears $100M". The Hollywood Reporter. Archived from the original on March 13, 2016. Retrieved March 13, 2016. ^ Tartaglione, Nancy (March 12, 2016). "'Zootopia' Bunny-Hopping To $100M+ In China; Sets Single-Day Animation Record". Deadline Hollywood. Archived from the original on March 13, 2016. Retrieved March 13, 2016. ^ Rob Cain (March 13, 2016). "'Zootopia' Tramples China's Animation Record With $60 Million Weekend". Forbes. Archived from the original on March 14, 2016. Retrieved March 14, 2016. ^ Rob Cain (March 14, 2016). "America's Booming Export To China: Talking Animals". Forbes. Archived from the original on March 14, 2016. Retrieved March 14, 2016. ^ Nancy Tartaglione (March 20, 2016). "'Zootopia' Zooms To $592M Global; Sets Animation Record In China Where 'The Revenant' Rides With $33M – Intl B.O." Deadline Hollywood. Archived from the original on March 22, 2016. Retrieved March 20, 2016. ^ "China Yearly Box Office". Box Office Mojo. Archived from the original on September 14, 2016. Retrieved September 15, 2016. ^ Busch, Anita (March 11, 2016). "'Zootopia' Crossing $300M Globally Today For Disney Animation". Deadline Hollywood. Archived from the original on March 12, 2016. Retrieved March 12, 2016. ^ Schilling, Mark (April 26, 2016). "Japan Box Office: 'Detective Conan' Wins Second Weekend, Beats 'Zootopia'". Variety. Archived from the original on April 26, 2016. Retrieved April 26, 2016. ^ "Japan Box Office: 'Zootopia' Opens Strong but Topped by Local Anime Film". The Hollywood Reporter. Archived from the original on April 27, 2016. Retrieved April 26, 2016. ^ Gavin J. Blair (May 9, 2016). "Japan Box Office: 'Zootopia' Climbs to No. 1 on its Third Weekend". The Hollywood Reporter. Archived from the original on May 10, 2016. Retrieved May 10, 2016. ^ Nancy Tartaglione (May 22, 2016). "'X-Men: Apocalypse' Dawns With $103.3M; 'Angry Birds' Sings $55.5M; 'Zootopia' #4 Animated Pic Ever WW – Intl Box Office". Deadline Hollywood. Archived from the original on May 24, 2016. Retrieved May 23, 2016. ^ a b Gavin J. Blair (May 23, 2016). "Japan Box Office: 'Zootopia' Passes $42M, Beats Previous Weekend Haul Again". The Hollywood Reporter. Archived from the original on May 24, 2016. Retrieved May 23, 2016. ^ Gavin J. Blair (May 30, 2016). "Japan Box Office: 'Zootopia' Hits $50M". The Hollywood Reporter. Archived from the original on May 30, 2016. Retrieved May 30, 2016. ^ Gavin J. Blair (June 6, 2016). "Japan Box Office: 'Deadpool' Dethrones 'Zootopia'". The Hollywood Reporter. Archived from the original on June 8, 2016. Retrieved June 8, 2016. ^ Nancy Tartaglione (June 26, 2016). "'Dory' Swims Past $100M Overseas; 'Pets' Is Cat's Meow In UK; 'Warcraft' Tops $400M WW – Intl Box Office". Deadline Hollywood. Archived from the original on June 27, 2016. Retrieved June 26, 2016. ^ Gavin J. Blair (June 13, 2016). "Japan Box Office: 'Zootopia' Crosses $60M; 'Money Monster' Can't Crack Top 5". The Hollywood Reporter. Archived from the original on June 15, 2016. Retrieved June 14, 2016. ^ Nancy Tartaglione (June 12, 2016). "'Warcraft' Cumes $261.7M Overseas With $156M China Weekend; 'Conjuring 2' Scares Up $50M – Intl Box Office Update". Deadline Hollywood. Archived from the original on June 13, 2016. Retrieved June 13, 2016. ^ Gavin J. Blair (July 4, 2016). "Japan Box Office: 'Alice Through the Looking Glass' Bows on Top With $5.2M". The Hollywood Reporter. Archived from the original on July 5, 2016. Retrieved July 4, 2016. ^ Nancy Tartaglione (July 3, 2016). "'Tarzan' Takes $18.8M In First Offshore Swing; 'TMNT2' Kicks Up $26M China Bow; 'Pets' Purrs – International Box Office". Deadline Hollywood. Archived from the original on July 4, 2016. Retrieved July 3, 2016. ^ "Top 100 Movies of 2016". Rotten Tomatoes. Fandango). Archived from the original on December 30, 2016. ^ "Zootopia Reviews". Metacritic. CBS Interactive. Archived from the original on March 6, 2016. Retrieved March 7, 2016. ^ "Zootopia". CinemaScore on Twitter. Retrieved July 21, 2016. ^ Genzlinger, Neil (March 3, 2016). "Review: In Zootopia, an Intrepid Bunny Chases Her Dreams". The New York Times. Archived from the original on March 4, 2016. Retrieved March 4, 2016. ^ Debruge, Peter (February 12, 2016). "Film Review: 'Zootopia'". Variety. Archived from the original on June 13, 2017. Retrieved March 4, 2016. ^ Goldman, Eric (February 29, 2016). "Zootopia Review". IGN. Archived from the original on March 5, 2016. Retrieved March 6, 2016. ^ Kermode, Mark (March 27, 2016). "Zootropolis review – Disney's animated odd couple has a perfect chemistry". The Observer. London. Archived from the original on December 24, 2016. Retrieved March 28, 2016. ^ Collin, Robbie (March 24, 2016). "Zootropolis is the Chinatown of talking animal films - review". The Daily Telegraph. London. Archived from the original on March 27, 2016. Retrieved March 28, 2016. ^ Seitz, Matt Zoller (March 4, 2016). "Zootopia Movie Review & Film Summary". RogerEbert.com. Ebert Digital LLC. Retrieved July 16, 2017. ^ Prince, Rosa (March 16, 2016). "Burn your princess dress: Disney's new heroine is a badass feminist rabbit". The Daily Telegraph. Archived from the original on March 20, 2016. Retrieved March 22, 2016. ^ Lang, Nico (March 10, 2016). "How Disney's Zootopia Gets Racism Wrong". Consequence of Sound. Retrieved January 5, 2018. ^ Faraci, Devin (March 3, 2016). "ZOOTOPIA Review: A Muddled Mess of Racial Messaging… And Cute Animals". BirthMoviesDeath. Retrieved January 5, 2018. ^ "Is Zootopia RACIST!?". Wisecrack. Retrieved January 5, 2018. ^ Jackson, Jenn M. (March 15, 2016). "'Zootopia': Disney's Feeble Attempt At Discussing Racism Without Discussing Racism". Water Cooler Convos. Retrieved January 5, 2018. ^ Johnson, Jason (March 11, 2016). "Zootopia: Yes, Disney Made a Movie About White Supremacy and the War on Drugs". The Root. Retrieved January 5, 2018. ^ Hipes, Patrick (December 8, 2016). "AFI Awards: Best Of 2016 Film List Includes 'Silence', 'Hacksaw Ridge' & More". Deadline Hollywood. Archived from the original on December 22, 2016. Retrieved December 8, 2016. ^ "Golden Globes 2017: The Full List of Winners". The Hollywood Reporter. January 8, 2017. Archived from the original on January 9, 2017. Retrieved January 8, 2017. ^ Atkins, Dorothy (November 8, 2017). "Disney Sheds Writer's Copyright Suit Over 'Zootopia'". Law360.com. Retrieved November 8, 2017. ^ "Goldman is Gone - Official Court Minutes". ^ Grassullo, Stephanie (March 1, 2016). "Top Toys for Kids That Are Wild for Zootopia". The Toy Insider. Archived from the original on April 26, 2017. Retrieved April 25, 2017. ^ Shaul, Brandy (August 18, 2016). "Disney Launches Zootopia Crime Files: Hidden Object on Mobile". Adweek. Archived from the original on April 26, 2017. Retrieved April 25, 2017. ^ McMillan, Graeme (May 7, 2018). "Dark Horse to Release 'Zootopia' Graphic Novel (Exclusive)". The Hollywood Reporter. ^ "Zootopia directors talk sequel, TV potential - EW.com". June 2, 2016. Retrieved January 7, 2018. ^ Peter Sciretta (June 6, 2016). "Zootopia 2 Talk Begins As Movie Becomes Second …". Retrieved March 30, 2018. ^ "Zootopia's Directors Are Already Thinking About Sequel Possibilities". Retrieved March 30, 2018. ^ "Zootopia: Ginnifer Goodwin Talks Challenges and Sequel Idea". Retrieved March 30, 2018. Wikimedia Commons has media related to Zootopia.